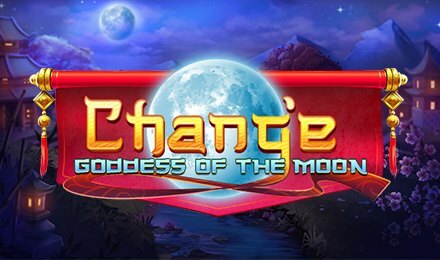 Chang’e – Goddess of the Moon slot is a 5 reel and 20 pay-lines slot game, based on the mythology of the lunar deity. An archer, known as Yi, had once shot down eight suns as it brought difficulty to earth. For this, he was awarded an elixir of immortality. One day, this elixir was getting stolen and Yi’s wife Chang’e drank it. And with that, she found residence in the moon. Powered by Pariplay, the reels of this slot game are embedded with symbols like; Yi, Chang’e, white rabbits, potions, lotus flowers, pie, ruan guitars, A, K, Q, J, 9 and 10. The highest paying symbol is the Potion Bottle, which awards 50x your stake for a five-symbol combination. Toggle the plus and minus buttons on the Bet Field to adjust your wager. The Auto Bet option allows you to set a number of automated spins to play on their own. Coin Values: Bets range from £0.02 to £10.00. The wild card is Chang’e herself. She replaces for all other symbols on the grid except for the scatter symbol. When this symbol lands on the grid, it locks into place and remains there for 2 to 5 spins. Line up five wilds on the slot grid and grab 50x your stake. Once the feature is launched, it is played on a 5 reel and 243 ways to win slot grid, where locked wilds come into play.